This scenario describes a classic implementation of the OpenStack Networking service using the ML2 plug-in with Linux bridge. Project networks provide connectivity to instances for a particular project. Regular (non-privileged) users can manage project networks within the allocation that an administrator or operator defines for for them. Project networks can use VLAN or VXLAN transport methods depending on the allocation. Project networks generally use private IP address ranges (RFC1918) and lack connectivity to external networks such as the Internet. Networking refers to IP addresses on project networks as fixed IP addresses. External networks provide connectivity to external networks such as the Internet. Only administrative (privileged) users can manage external networks because they interface with the physical network infrastructure. External networks can use flat or VLAN transport methods depending on the physical network infrastructure and generally use public IP address ranges. A flat network essentially uses the untagged or native VLAN. Similar to layer-2 properties of physical networks, only one flat network can exist per external bridge. In most cases, production deployments should use VLAN transport for external networks. Routers typically connect project and external networks. By default, they implement SNAT to provide outbound external connectivity for instances on project networks. Each router uses an IP address in the external network allocation for SNAT. Routers also use DNAT to provide inbound external connectivity for instances on project networks. Networking refers to IP addresses on routers that provide inbound external connectivity for instances on project networks as floating IP addresses. Routers can also connect project networks that belong to the same project. Other supporting services include DHCP and metadata. The DHCP service manages IP addresses for instances on project networks. The metadata service provides an API for instances on project networks to obtain metadata such as SSH keys. The example configuration creates one flat external network and one VXLAN project network. However, this configuration also supports VLAN external and project networks. The Linux bridge agent does not support GRE project networks. These prerequisites define the minimal physical infrastructure and immediate OpenStack service dependencies necessary to deploy this scenario. For example, the Networking service immediately depends on the Identity service and the Compute service immediately depends on the Networking service. These dependencies lack services such as the Image service because the Networking service does not immediately depend on it. However, the Compute service depends on the Image service to launch an instance. The example configuration in this scenario assumes basic configuration knowledge of Networking service components. One controller node with one network interface: management. 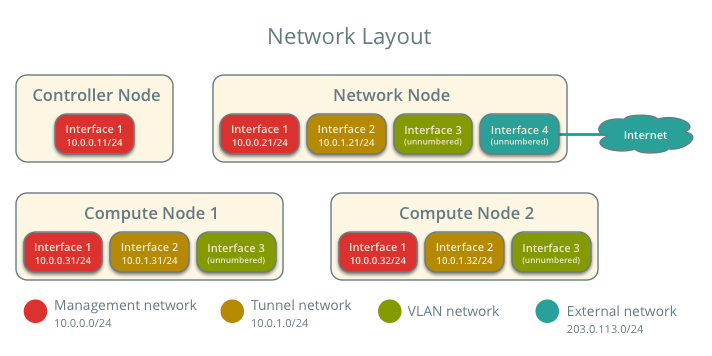 One network node with four network interfaces: management, project tunnel networks, VLAN project networks, and external (typically the Internet). 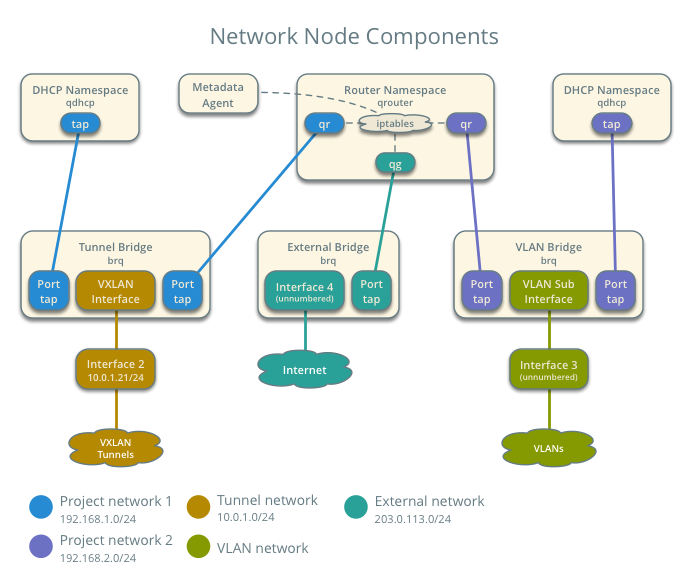 At least one compute nodes with three network interfaces: management, project tunnel networks, and VLAN project networks. To improve understanding of network traffic flow, the network and compute nodes contain a separate network interface for VLAN project networks. In production environments, you can use any network interface for VLAN project networks. In the example configuration, the management network uses 10.0.0.0/24, the tunnel network uses 10.0.1.0/24, and the external network uses 203.0.113.0/24. The VLAN network does not require an IP address range because it only handles layer-2 connectivity. For VLAN external and project networks, the physical network infrastructure must support VLAN tagging. For best performance with VXLAN project networks, the network infrastructure should support jumbo frames. Using VXLAN project networks requires kernel 3.13 or newer. Operational SQL server with neutron database and appropriate configuration in the neutron.conf file. Operational message queue service with appropriate configuration in the neutron.conf file. Operational OpenStack Identity service with appropriate configuration in the neutron.conf file. Operational OpenStack Compute controller/management service with appropriate configuration to use neutron in the nova.conf file. Neutron server service, ML2 plug-in, and any dependencies. Linux bridge agent, L3 agent, DHCP agent, metadata agent, and any dependencies. Linux bridge agent and any dependencies. 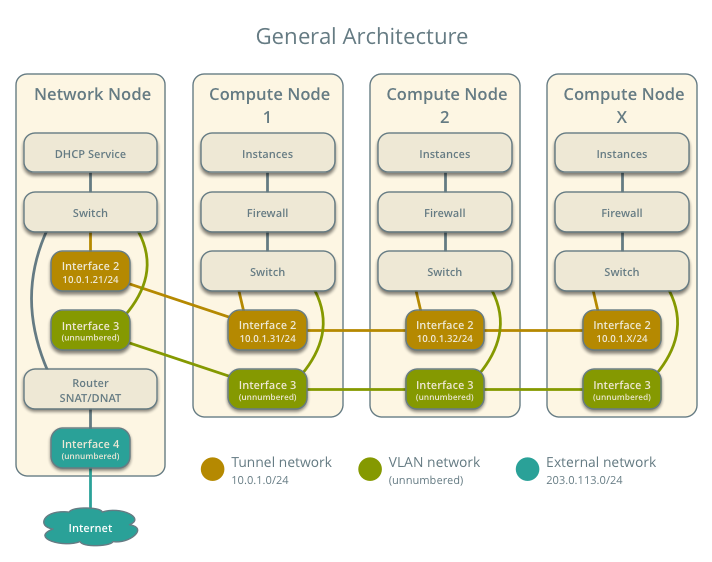 The classic architecture provides basic virtual networking components in your environment. Routing among project and external networks resides completely on the network node. Although more simple to deploy than other architectures, performing all functions on the network node creates a single point of failure and potential performance issues. Consider deploying DVR or L3 HA architectures in production environments to provide redundancy and increase performance. However, the DVR architecture requires Open vSwitch. 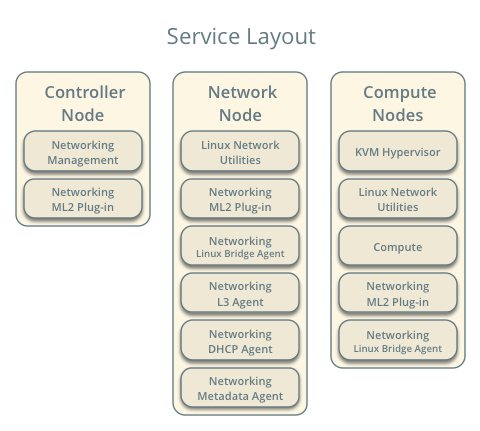 Linux bridge agent managing virtual switches, connectivity among them, and interaction via virtual ports with other network components such as namespaces and underlying interfaces. DHCP agent managing the qdhcp namespaces. The qdhcp namespaces provide DHCP services for instances using project networks. L3 agent managing the qrouter namespaces. The qrouter namespaces provide routing between project and external networks and among project networks. They also route metadata traffic between instances and the metadata agent. Metadata agent handling metadata operations for instances. The compute nodes contain the Linux bridge agent managing virtual switches, connectivity among them, and interaction via virtual ports with other network components such as namespaces, security groups, and underlying interfaces. North-south network traffic travels between an instance and external network, typically the Internet. East-west network traffic travels between instances. For instances with a fixed IP address, the network node routes north-south network traffic between project and external networks. 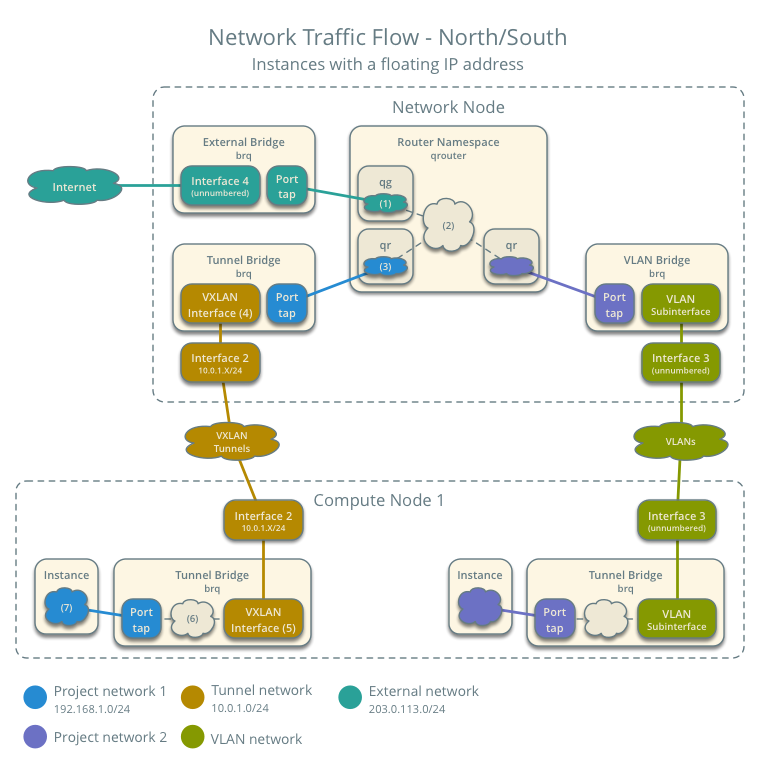 Instance 1 resides on compute node 1 and uses a project network. The instance sends a packet to a host on the external network. 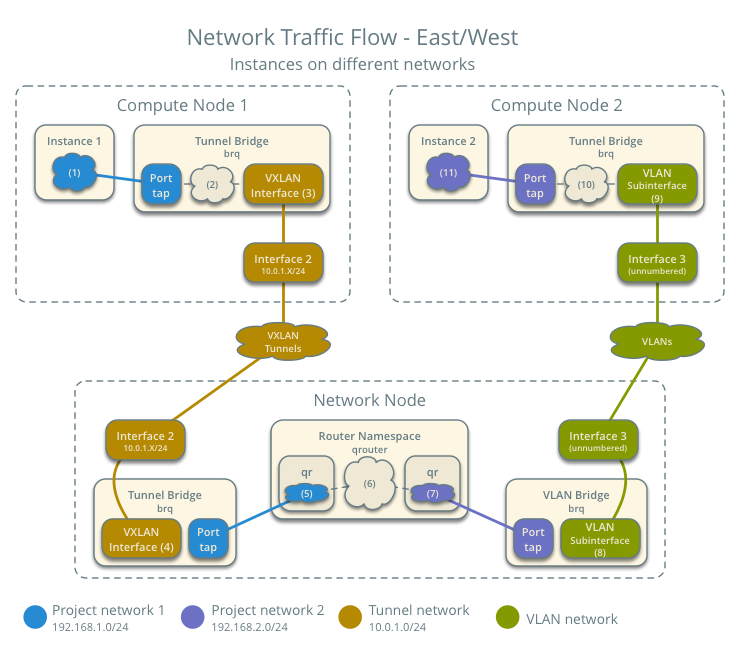 Although the diagram shows both VXLAN and VLAN project networks, the packet flow only considers one instance using a VXLAN project network. The instance 1 tap interface (1) forwards the packet to the tunnel bridge qbr. The packet contains destination MAC address TG because the destination resides on another network. Security group rules (2) on the tunnel bridge qbr handle state tracking for the packet. 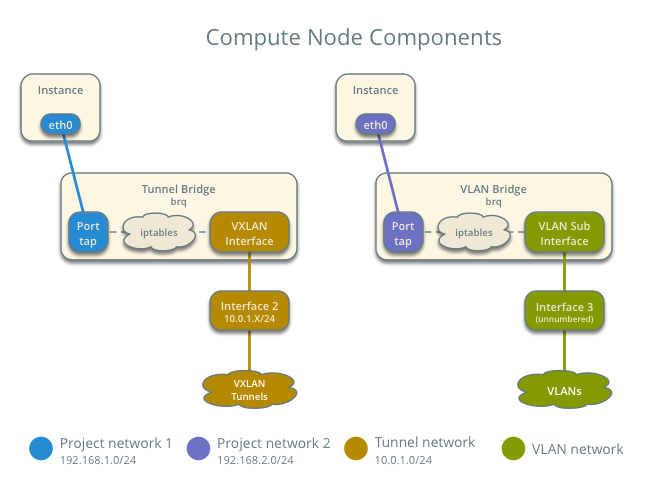 The tunnel bridge qbr forwards the packet to the logical tunnel interface vxlan-sid (3) where sid contains the project network segmentation ID. The physical tunnel interface forwards the packet to the network node. The instance 1 tap interface forwards the packet to the VLAN bridge qbr. The packet contains destination MAC address TG because the destination resides on another network. Security group rules on the VLAN bridge qbr handle state tracking for the packet. The VLAN bridge qbr forwards the packet to the logical VLAN interface device.sid where device references the underlying physical VLAN interface and sid contains the project network segmentation ID. The logical VLAN interface device.sid forwards the packet to the network node via the physical VLAN interface. The physical tunnel interface forwards the packet to the logical tunnel interface vxlan-sid (4) where sid contains the project network segmentation ID. The logical tunnel interface vxlan-sid forwards the packet to the tunnel bridge qbr. The tunnel bridge qbr forwards the packet to the qr interface (5) in the router namespace qrouter. The qr interface contains the project network router interface IP address TG. The physical VLAN interface forwards the packet to the logical VLAN interface device.sid where device references the underlying physical VLAN interface and sid contains the project network segmentation ID. The logical VLAN interface device.sid forwards the packet to the VLAN bridge qbr. The VLAN bridge qbr forwards the packet to the qr interface in the router namespace qrouter. The qr interface contains the project network 1 gateway IP address TG. The iptables service (6) performs SNAT on the packet using the qg interface (7) as the source IP address. The qg interface contains the project network router interface IP address TR. The router namespace qrouter forwards the packet to the external bridge qbr. The external bridge qbr forwards the packet to the external network via the physical external interface. For instances with a floating IP address, the network node routes north-south network traffic between project and external networks. The instance receives a packet from a host on the external network. The physical external interface forwards the packet to the external bridge qbr. The external bridge qbr forwards the packet to the qg interface (1) in the router namespace qrouter. The qg interface contains the instance floating IP address F1. The iptables service (2) performs DNAT on the packet using the qr interface (3) as the source IP address. The qr interface contains the project network gateway IP address TR. The router namespace qrouter forwards the packet to the tunnel bridge qbr. 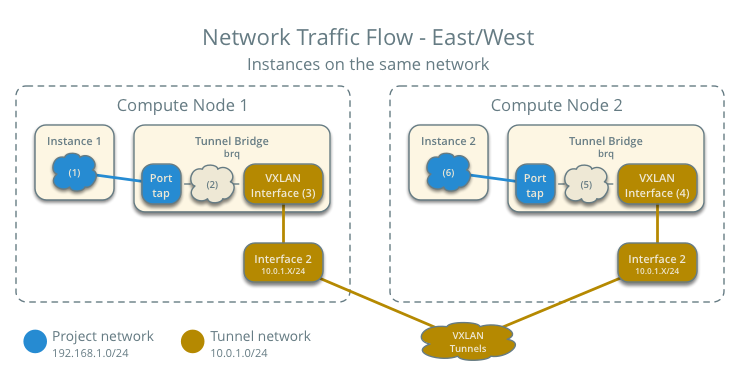 The tunnel bridge qbr forwards the packet to the logical tunnel interface vxlan-sid (4) where sid contains the project network segmentation ID. The physical tunnel interface forwards the packet to compute node 1. The router namespace qrouter forwards the packet to the VLAN bridge qbr. The physical VLAN interface forwards the packet to compute node 1. The physical tunnel interface forwards the packet to the logical tunnel interface vxlan-sid (5) where sid contains the project network segmentation ID. Security group rules (6) on the tunnel bridge qbr handle firewalling and state tracking for the packet. The tunnel bridge qbr forwards the packet to the tap interface (7) on instance 1. Security group rules on the VLAN bridge qbr handle firewalling and state tracking for the packet. The VLAN bridge qbr forwards the packet to the tap interface on instance 1. 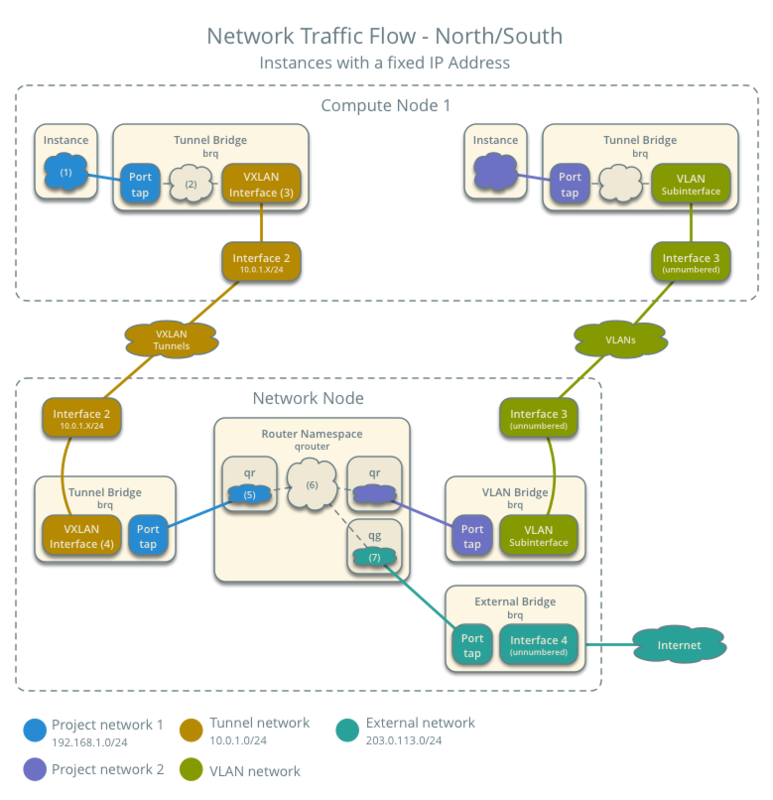 For instances with a fixed or floating IP address, the network node routes east-west network traffic among project networks using the same project router. 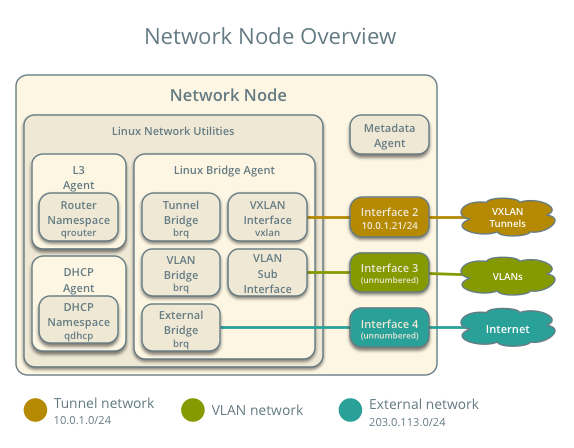 Instance 1 resides on compute node 1 and uses VXLAN project network 1. 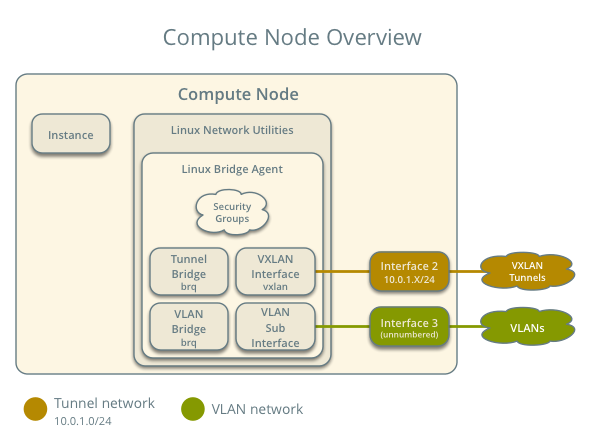 Instance 2 resides on compute node 2 and uses VLAN project network 2. Both project networks reside on the same router. The instance 1 tap interface (1) forwards the packet to the tunnel bridge qbr. The packet contains destination MAC address TG1 because the destination resides on another network. The tunnel bridge qbr forwards the packet to the qr-1 interface (5) in the router namespace qrouter. The qr-1 interface contains the project network 1 gateway IP address TG1. The router namespace qrouter routes the packet (6) to the qr-2 interface (7). The qr-2 interface contains the project network 2 gateway IP address TG2. The VLAN bridge qbr forwards the packet to the logical VLAN interface vlan.sid (8) where sid contains the project network segmentation ID. The physical VLAN interface forwards the packet to compute node 2. The physical VLAN interface forwards the packet to the logical VLAN interface vlan.sid (9) where sid contains the project network segmentation ID. The logical VLAN interface vlan.sid forwards the packet to the VLAN bridge qbr. Security group rules (10) on the VLAN bridge qbr handle firewalling and state tracking for the packet. The VLAN bridge qbr forwards the packet to the tap interface (11) on instance 2. For instances with a fixed or floating IP address, the project network switches east-west network traffic among instances without using a project router on the network node. Instance 1 resides on compute node 1. Instance 2 resides on compute node 2. Both instances use the same VXLAN project network. The Linux bridge agent handles switching within the project network. The instance 1 tap interface (1) forwards the packet to the tunnel bridge qbr. The packet contains destination MAC address I2 because the destination resides the same network. The physical tunnel interface forwards the packet to compute node 2. Security group rules (5) on the tunnel bridge qbr handle firewalling and state tracking for the packet. The tunnel bridge qbr forwards the packet to the tap interface (6) on instance 2. Use the following example configuration as a template to deploy this scenario in your environment. Replace MIN_VLAN_ID, MAX_VLAN_ID, MIN_VXLAN_ID, and MAX_VXLAN_ID with VLAN and VXLAN ID minimum and maximum values suitable for your environment. The first value in the tenant_network_types option becomes the default project network type when a regular user creates a network. The external value in the network_vlan_ranges option lacks VLAN ID ranges to support use of arbitrary VLAN IDs by administrative users. Replace PROJECT_VLAN_INTERFACE and EXTERNAL_INTERFACE with the name of the underlying interface that handles VLAN project networks and external networks, respectively. Replace TUNNEL_INTERFACE_IP_ADDRESS with the IP address of the interface that handles project tunnel networks. The external_network_bridge option intentionally contains no value. (Optional) Reduce MTU for VXLAN project networks. Replace METADATA_SECRET with a suitable value for your environment. Replace PROJECT_VLAN_INTERFACE with the name of the underlying interface that handles VLAN project networks and external networks, respectively. Replace TUNNEL_INTERFACE_IP_ADDRESS with the IP address of the interface that handles VXLAN project networks. This example creates a flat external network and a VXLAN project network. The example configuration contains vlan as the first project network type. Only an administrative user can create other types of networks such as VXLAN. The following commands use the admin project credentials to create a VXLAN project network. Source the regular project credentials. The following steps use the demo project. Added interface 4f819fd4-be4d-42ab-bd47-ba1b2cb39006 to router demo-router. The qdhcp namespace might not exist until launching an instance. Launch an instance with an interface on the project network. Obtain console access to the instance. PING openstack.org (174.143.194.225) 56(84) bytes of data. PING 203.0.113.102 (203.0.113.112) 56(84) bytes of data.